When it comes to our cravings, Aaron is always in the mood for Mexican food, while I could eat Italian any night of the week. Since either one is always a good option, we went for a little of each this week. 1. Burrito bowls made with leftover shredded beef (see #3). I used the rice and beans recipes from Iowa Girl Eats burrito bowls, layered on the beef, and topped with corn, cheese, salsa, and avocado. Look familiar? Yep, we ate this last week too, except with chicken. 2. Lasagna Stuffed Spaghetti Squash from Closet Cooking. Never in a million (or ten) years did I think that I would get Aaron to eat squash. For dinner. As a meal. But this is try number two with spaghetti squash, and again, it was a success! 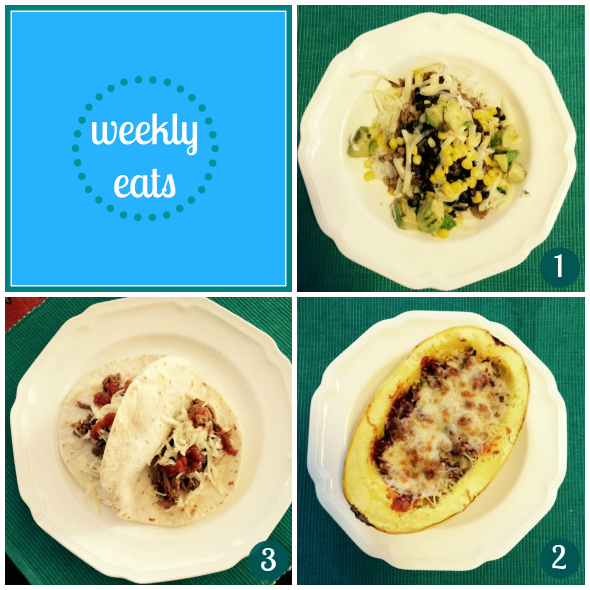 The squash "bowls" are filled with ricotta cheese, hearty meat sauce, and topped with shredded mozzarella. Even my pasta-loving self didn't miss the spaghetti. 3. Slow Cooker Shredded Beef Tacos from Budget Bytes. My favorite slow cooker recipes are the ones tailor-made for the super-lazy cook. You know, the ones that don't even require any chopping before you just throw everything in there and go. This is one of those. Sure, it says cut up the beef. Easy enough, but I just put the whole sucker in there, and it turned out great. Sometimes, it pays to be lazy. Now we have beef for days. Still. 4. Not pictured, but worth mentioning: Skillet Eggplant Parmesan from Annie's Eats. We had family over for dinner on Sunday, and decided to go with classic Italian. Meatballs with pasta are always a hit, but I wanted to make something different to accompany them. Like a nice healthy vegetable. Or, a nice healthy vegetable layered with lots of melty cheese and red sauce. Door number two, please. LOL, Mexican and Italian are pretty much my favorite food genres and we had both this week too! We made our homemade enchiladas one night and we got Italian takeout last weekend! So yummy! They're the best, right!? Mmm, homemade enchiladas sound amazing. Yum. Both are always great choices :) Thanks Jennifer! !